Hey, people! 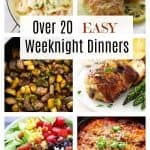 It is almost Thanksgiving again and time to plan your menu. 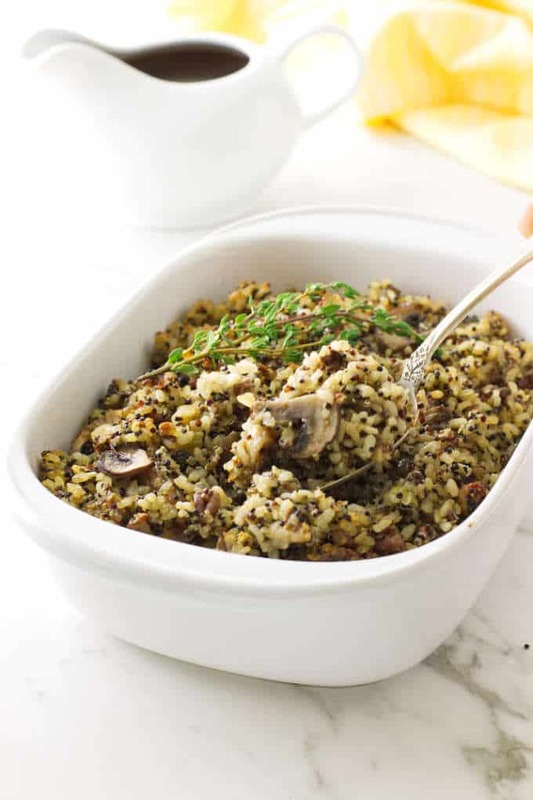 We are happy to share this Sprouted Brown Rice and Quinoa Stuffing with you. This savory gluten free stuffing includes fresh veggies, herbs, nuts and bacon. 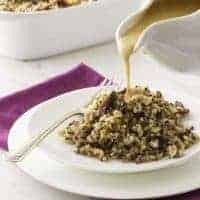 A gluten-free savory stuffing sensation of sprouted brown rice and quinoa, vegetables and a touch of sweetness from dried figs. At our house, turkey is for Thanksgiving! And there has to be a stuffing! I love the traditional, old-fashioned stuffing made with bread cubes, celery and onions that is stuffed and baked in the bird. This year we are also serving our sprouted brown rice and quinoa stuffing. 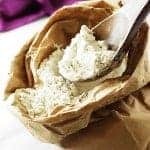 This is a nutritious and healthy gluten-free stuffing that everyone can enjoy and your gluten-free guests will love you forever for thinking of them. A savory mix for stuffing the bird or baking in a casserole dish. 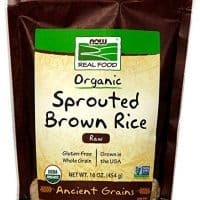 Is There a Difference Between Sprouted Brown Rice and Regular Brown Rice? 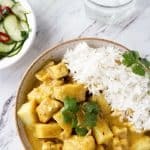 When it comes to gluten there is no difference as all rice is gluten-free. While sprouted brown rice looks like regular brown rice, and it is cooked for the same amount of time there are some differences. During the sprouting process rice absorbs water so the grains will take less water during the cooking process. We recommend the ration of 1:1.5 when cooking sprouted short-grain rice. 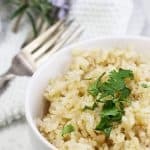 Both sprouted and regular brown rice will be perfectly cooked in 30 minutes and not be mushy. Sprouting increases the nutritional value of the grain by making the nutrients more bio-available. Also, after cooking, sprouted brown rice is sweeter, more delicate and less chewy than regular brown rice. This ancient grain/seed has become a major player in today’s meal planning. 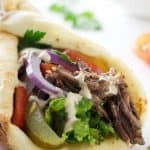 This is partly because it is gluten-free and works well in the gluten-free diets. 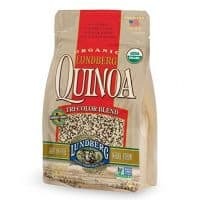 Quinoa also cooks quickly and has a bit of crunchy texture. We begin preparing this savory, earthy gluten free stuffing by cooking the rice and the quinoa. They cook in separate saucepans then transferred to a large mixing bowl before combining with the other ingredients. While the rice and quinoa are cooking we cooked slices of bacon until crispy and added to the bowl with the rice and quinoa. Onions, mushrooms and celery are sautéed in some of that yummy bacon fat and added to the bowl. 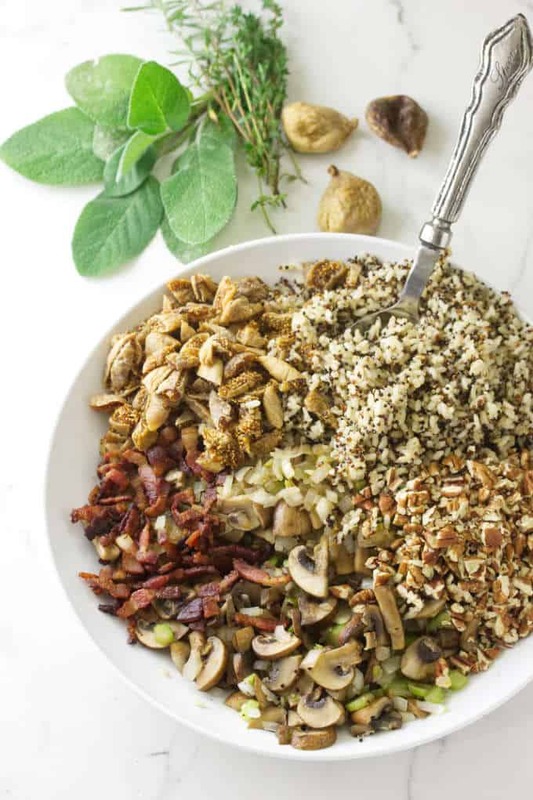 We added the chopped pecans, figs herbs and spices to the bowl; whisked up two eggs and added it to the bowl of rice, quinoa and vegetables. 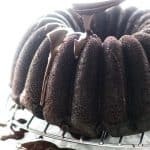 Everything was combined well with a little melted butter, transferred to an oven-proof casserole dish and baked until golden on top. We all remember how hectic it can be in the kitchen on Thanksgiving Day. 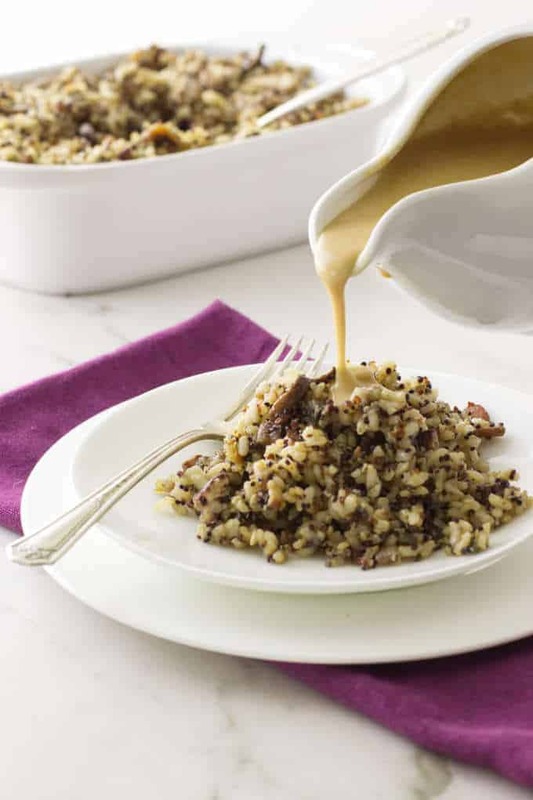 A huge time-saver is to prepare this sprouted brown rice and quinoa stuffing the night before. Just cover the casserole dish with foil and refrigerate it. Bake the stuffing while the turkey is resting. Then serve it piping hot! So, why not try this sprouted brown rice and quinoa stuffing for the big Thanksgiving Day feast? You can still stuff the bird with the traditional crusty bread stuffing just like always. Happy Thanksgiving, Everyone! 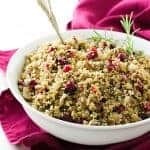 A gluten-free savory stuffing sensation of sprouted brown rice and quinoa, vegetables, fresh herbs and a touch of sweetness from dried figs. In a 2-quart saucepan, combine rice, chicken broth, lemon juice and the salt. Bring to a boil, reduce heat, cover and cook until all the liquid has evaporated, 25 minutes. Remove from heat, fluff and let cool. Transfer to a large mixing bowl. In a small saucepan set over medium-high, add the quinoa chicken broth, lemon juice and the salt. Bring to a boil, reduce the heat to low, cover and simmer for15 minutes. Remove from the heat, fluff and let cool for 10 minutes. Transfer to the large bowl with the rice. Preheat oven to 350°F Lightly coat a 2-quart oven-proof casserole dish with oil-spray. Add the bacon to a large skillet set over medium heat and cook until crisp. With a slotted spoon, transfer the bacon to a paper towel-lined plate to drain. Reserve 2 tablespoons of the bacon drippings and discard any excess. Add the onions, mushrooms and celery to the skillet with the bacon drippings and cook until they are soft, about 5 minutes. Transfer the cooked vegetables to the bowl of rice along with the drained bacon, pecans, figs, cumin, sage and rosemary. Whisk the eggs lightly and stir into the rice-quinoa mixture, combining well. Adjust salt and pepper as necessary. Spoon the mixture into the prepared casserole dish and brush the top with the melted butter. Transfer to the middle of the oven and bake for 25-30 minutes until lightly browned. Remove from the oven, sprinkle with fresh herbs and serve. Sprouted brown rice is gluten-free and the sprouting process increases its nutritional value. During tthe sprouting process the rice absorbs water, we recommend using 1/4 cup less water per cup of rice than you would normally use for cooking regular un-sprouted rice. Both sprouted rice and regular rice will be perfectly cooked in 25-30 minutes. Before cooking, rinse the quinoa in a fine-mesh strainer under cold water to remove the coating of saponins. Some manufacturers have pre-washed quinoa. Check the package to determine if rinsing is required. It is usually posted on the front of the package or in the instructions. If unsure, rinse under cold water. When chopping the dried figs, keep a damp paper towel to occasionally wipe the sticky from the knife. Kitchen scissors will do a great job in cutting the dried figs.